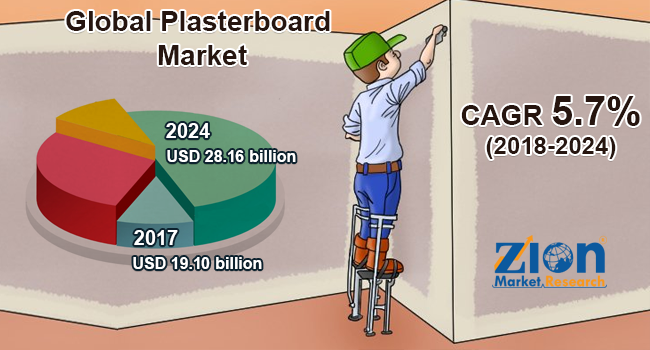 Global plasterboard market expected to reach USD 28.16 billion in 2024, growing at a CAGR of 5.7% between 2018 and 2024. Changing consumer preferences and rapid urbanization along with the robust need for the cost-effective construction materials contribute to the growth of the global plasterboard market. The report provides the comprehensive glance of the plasterboard market on the global and regional level. The study provides historic data from 2015 to 2017 along with a forecast from 2018 to 2024 based on revenue and volume. The study includes major driving forces and restraints for the plasterboard market along with the impact they have on the demand over the forecast period. Furthermore, the study also provides the major avenues of global plasterboard market. The global plasterboard market study also comprises the detailed value chain analysis for providing a comprehensive view of the market. Moreover, the study also includes Porter’s Five Forces model for plasterboard, to understand the competitive landscape of the global market. The study includes a market attractiveness analysis of all the segments related to the market. The study provides a significant view of the global plasterboard market by classifying it into form, type, end-user industry, and region segmentation. These segments have been estimated and forecasted with the future and past trends. On the basis of form, the market has been segmented into square-edged and tapered-edged. The key types of the plasterboard have been segmented into standard, fire resistant, sound insulated, moisture resistant, thermal, specialist, impact resistant, triple low end, and gas filled. The key end-user industry in the report has been segmented into residential and nonresidential. The regional segmentation includes the Middle East & Africa, Asia Pacific, Europe, Latin America, and North America. Furthermore, it is bifurcated into major countries such as the U.S., the UK, Germany, France, China, Japan, India, and Brazil. Major vendors of global plasterboard market include Georgia Pacific LLC, Etex Group, Ayhaco Gypsum Products, Jason Plasterboard Co. Ltd., Gypsum Management, Saint-Gobain S.A., Supply, Inc., Armstrong World Industries Inc., USG Corporation, National Gypsum, Knauf Gips KG, Siniat Ltd., Tanzania Gypsum Limited, Atiskan Gypsum Products Co. Inc., Lafarge Holcim Ltd., Boral Ltd., and Fletcher Building Ltd., among others.